Both Moolavar and Uthsavar have Panchayuda(5 weapons). Uthsava moorthy is believed to made of solid gold. Entry to the temple is through the Big door on the north side as eighteen steps leading to the temple tower (guraded by karuppu devata) is not opened these days. Noopura Ganga falls is on the Silambaru river and is about 4 kms. from the temple. The hills surrounding the temple are called Vrishabadri as they look like Vrishaba and cow. During Trivikrama avathara part of the water used to wash the feet of Lord by Brahma passing through the Silambu (ornament worn by dancers on the legs – Gungroo) fell here and flowed , hence called Silambaru. About 19 kms from the Madurai by road. Deva Pushkarni (Tiruparkadal – Ksheerabdi). The temple is divided in 4 levels(Storeys). The first level has Uragamellanayan(Main) in Sayana Posture. In Dakshineswara Nrisimha, Uttareswara Nrisimha, Ksheerabdinathan,Stitha Narayanan Sannadhis, the Lord gives darshan in various postures of standing, sitting, sayana(lying), Walking and dancing signifying the various forms He takes to protect His devotees. Sayana Perumal is seen blessing Adisesha. In the second and third levels , the Lord is seen in standing and sitting postures. Bhagawat Ramanuja gave to Mankind the secret and sacred TIRUMANTRAM, the savior of all, against the wishes of his Guru to save the mankind from rebirth. The Ashtanga Vimanam was constructed by Vishwakarma and Mayan. 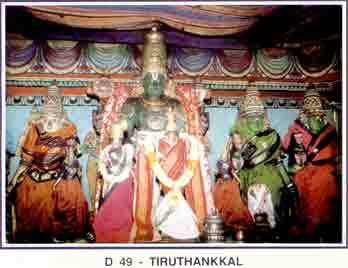 The idols of Tirukottiyur Nambi and Bhagwat Ramanuja are installed in the temple. 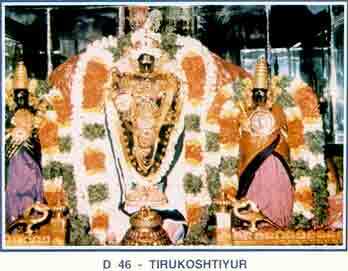 At the ground level, the Lord gives darshan as Natanakrishna. The place is called Goshtipuram as Devas assembled here as one unit(Goshti) Sri vaishnavas call this place as “Dwayam Vilaninda Tirupati” – the birth place of Dwayamantra. About 11 kms from Tiruppattur on the Madurai Karaikkudi road. Also near Devakottai Rasta railway station. Fine workmanship is seen in this temple. Engraved on the walls are the Brahma, and other devas. It is beleived that Adisesha protects this Kshetra. As per sthalapurana the Asuras (demons) surreptiously entered to attack the Lord. Adisesha drove them away by hissing creating air filled with poison. 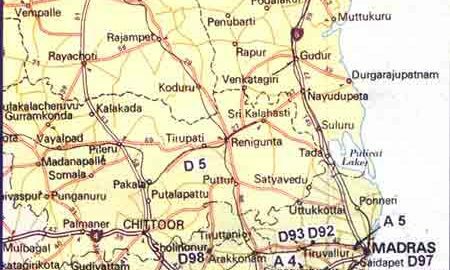 About 1.5 kms from Tirumeyyam Railway station on the Pudukottai Karaikkudi route. Hema Pushkarni, Chakra Theertham, Ratnakara Samudram. Ashwatta Narayanan, Samudra Rajan, Pullaranyamuni. Srirama, lying on Dharba(Dry twigs) requested for Samudrarjan to make way for the construction of bridge to retrieve Sita from Lanka – hence people worship him here as Dharbasayana Rama. In this temple Lakshmana is serving(kainkarya). Rama as Aadisesha and in Pattabhisheka Sannidhi He is in the traditional form. The Lord presented Himself under the Ashwwattha tree to pullva Maharishi here, pleased with Ashtakshara Japa and hence this place is called Pullaranya. Sethusnan is considered to be very auspicious. Rameshwaram is nearby and Danushkoti, washed away in cyclone and floods, was near this place. About 9 kms from Ramanathapuram. 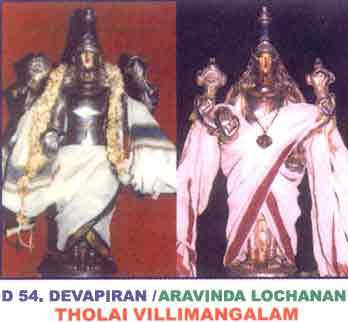 *Moolavar – Nindra narayanan* Posture: Standing Thirumugamandalam: East Uthsavar: Thiruthankalappan. Sridevi, Salyapandyan, a Tiger, Srivallbhan. Temple is atop a hillock. Sridevi (Annanayaki) and Neeladevi (Anantanayaki) are on the right. 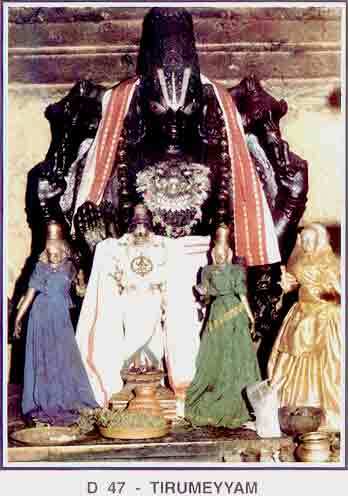 Bhoodevi (Amrutanayki ) and Jaambavati are on the left of the Lord in the Nindra Narayanan Sannidhi. All idols are of clay and painted. hence no Abhisek is performed as also the Sayana Perumal below. Sengamalathayar has separate sannidhi and Abhishek is performed here. Garudazhwar is seen with serpent and Amruta kalasa. Aniruddha , grandson of Lord Krishna , married Usha at this place. 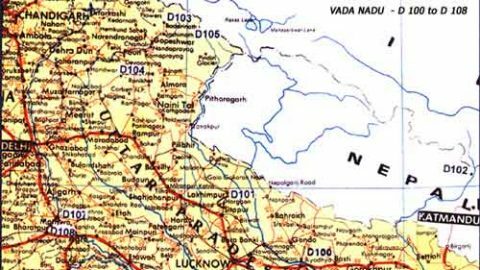 King Chandraketu , who due to a curse was born a tiger, was able to recollect the previous pious birth, worshipped the Lord and obtained Moksha here. Thiruttankal is a railway station on the Virudanagar Thenkasi route. 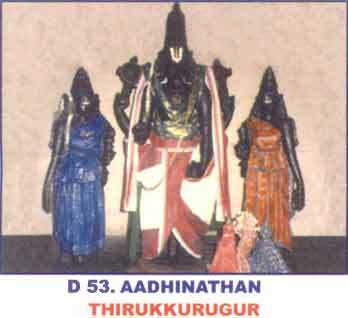 Moolavar: *Kalamegha Perumal* Posture: Standing with Varadhahastha in Right hand and Gadha in Left Hand Thirumugamandalam: East Uthsavar: Tirumogur Aapthan (with Panchayudhas). There is a sperate Sannadhi for Pallikonda (Sayana) Perumal. The beautiful idol of Sudharsana Azhwar has Nrisimha on the back side. The Lotus pond near the temple is very beautiful. 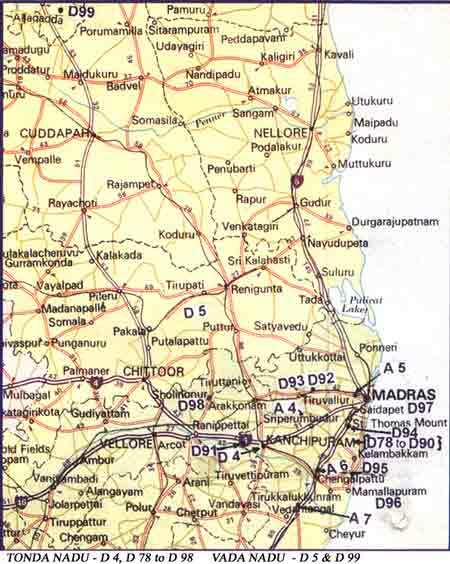 About 11 kms from Madurai on the Madurai – Melur – Tiruvadavur. 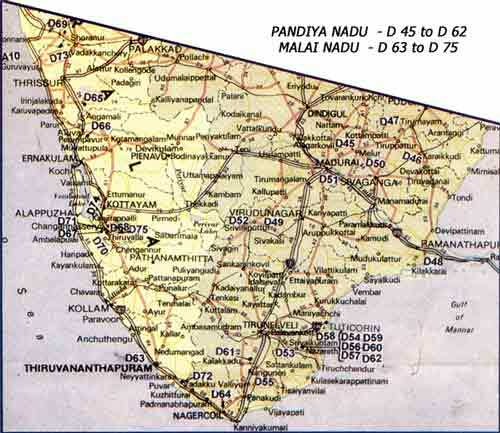 *Madhuravalli, Vagulavalli, Varagunavalli and Maragathavalli* are other names for Thayar. 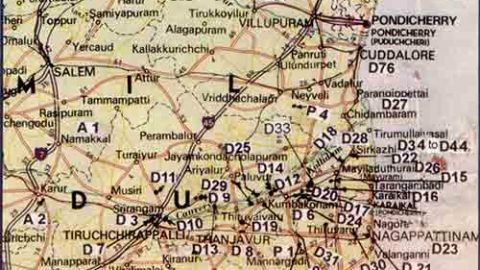 Hema Pushkarini, Chakra Theertham, Kruthamala and Vaigai rivers. 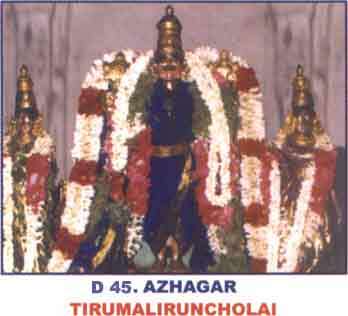 It was here that Periazhwar sang “Tirupallandu” (the first Dasakam of Periazhwar Tirumozhi) offering Mangalasasanam for the Lord, His Consorts, His Ayudas(weapons), other Ornaments and His devotees. One can see the ashtanga vimanam from a higher level in the temple, where the Lord gives darshan as Pallikonda Perumal (Sayana) and Suryanarayana in standing posture which are immensely beautiful. As per Sthalapuarna, once heavy rain and floods created a big structure preventing further rain. 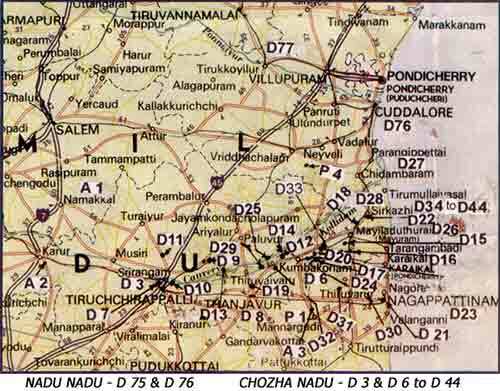 Since the clouds joined together, the place is called Tirukoodal (koodal – to meet). This Kshetra is in Madurai itself. Behind bus-stand and about 1/2 km from railway station. Avathara sthala of Periazhwar and Andal. Lord Ranganatha of Srirangam married Andal here. Andal and Garudazhwar are on either side of the Lord in standing posture. The standing posture of Garuda near the Lord is unique feature of this place. The Araiyar seva, like in Srirangam, is very famous. The place is named after the hunter kings Villi and Putthan who built this town and their ../images are installed in the temple. 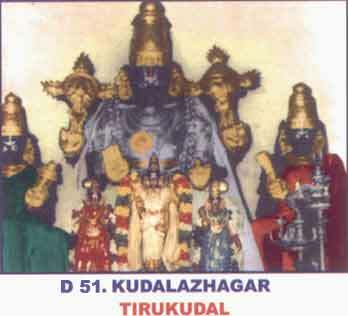 Periazhwar who was performing Pushpa kanikaryam for the Temple , one day found Andal wearing the garlands meant for Lord. That day Azhwar offered fresh garland to the Lord but the Lord refused to wear any other garland except the one used by Andal and hence Andal is called “Choodi Kuduttha Nacchiyar”. 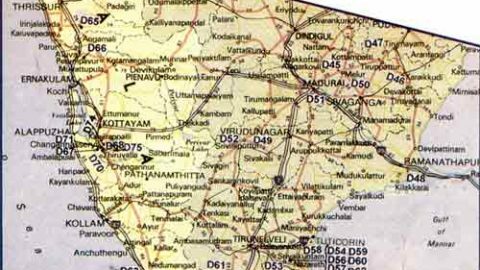 About 2.4 kms from Srivilliputhur station on the Tenkasi – Virudunagar route. Swayambhoo Kshetram. The Feet of the Lord is believed to be buried underground. Avathara Sthala of Nammazhwar. The divine Sthalavriksham under which Azhwar stayed in for 18 years in the care of Aadipiran (lord) can be seen even to his day. It is believed that Lakshmana has taken the form of tamarind tree here. There is a Sannidhi for Gyanapiran (Varaha Avatar). 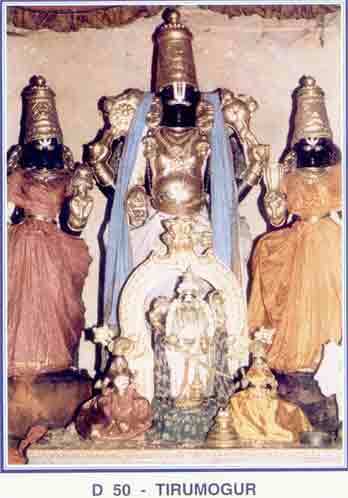 This Kshetra is one of Azhwar Nava (Nine) Tirupatis nearby. The Garudaseva during Vaikasi (May-Jun) Vishaka is very famous with Mangalashasan of the Lord by Nammazhwar in Hamsa Vahana and Madurakavi Azhwar. Indra who was cursed for not looking after his parents properly, prayed here and obtained Vimochan, so says sthalapurana. The Arayar seva as in Srirangam is performed here. About 25 kms from Tirunelveli and about 1.5 kms from Azhwar Tirunagari station. Nammazhwar (11) Total – 11 pasurams. Atthireya Suprapa muni established a Yaga sala. During inspection of the yagasala with Rit-Wiks , he found a very bright Tholai (Tharasu Scale) and a vil(Dhanus – bow). With his touch they turned into a man and woman. 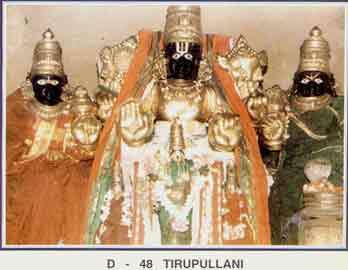 The place is called Tholaivillimangalam as Tholai and vil obtained mukti from the curse of Kubera. 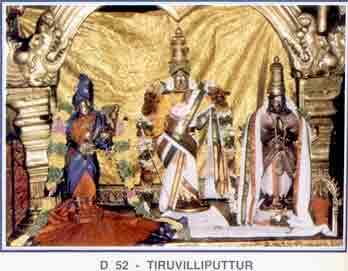 Two temples together make one Divya desa and hence called Erattai (Tirupati) and are one of the Azhwar nava Tirupati. About 3 kms from Srivaikuntam. 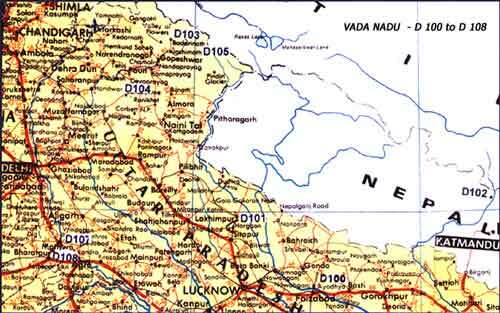 The temples are about 150mts from apart and the second temple is on the banks of the Tamarabharani river.